I have not discussed about facial mask lately and I think that it is time for me to share another of my favourite mask. 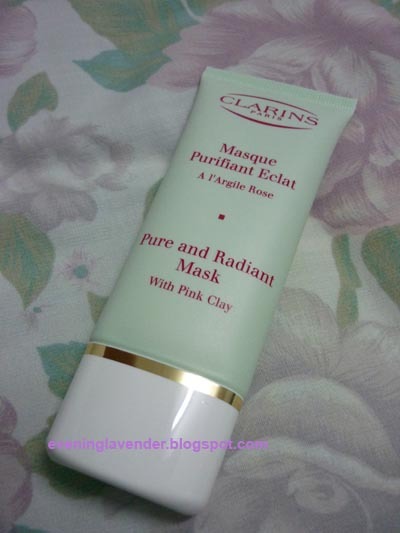 I was first introduced to Clarins Pure & Radiant Mask with Pink Clay when I received a 5ml sample to try out. After using the sample, I have fond memories of it, partly because of its lovely sounding ingredient name - "Pink Clay". I remember the mask as Pink Clay mask from then on. When I finished my Origins Out of Trouble 10 min mask, I took the opportunity to grab myself this one as a "replacement". Well, it cannot exactly replace the Origins one ...... read on to find out why. Being the person who love to own many types of mask, if you followed my review, you would know that I have tried more than 10 types of mask so far and am thinking of getting more. I have to stop myself from buying in case I can't finish them by the expiry date. Enough of rambling, I shall get on with the review. A deep-purifying mask—with refreshing Pink Clay and Alpine Willow Herb—cleans, tightens and refines pores, leaving a fresh matte result in just 5 minutes. Softens, smoothes and comforts irritated skin with Linden extract. Non-drying texture rinses easily and is suitable for even the most sensitive skin. What I like about this mask? However, this mask does not help to dry up pimples like the Origins Out of Trouble 10 min mask. But then again, Clarins did do not claim that it can do the "pimple busting job". I'm just sharing so that you know that even though both are clay masks, they are not the same. So, if you have oily skin but no pimples, you can try this Clarins Pink Clay mask, but if you have pimples and also oily skin, you should consider Origins Out of Trouble mask instead. Having said that, I am happy that Clarins Pink Clay mask does make my skin feel happy and cleansed after each application. Whenever I feel my skin is a bit congested and need some deep cleansing, I would reach for this mask to do the task and I am so far happy with its result. Do you have the same Clarins Pink Clay mask? How do you rate it? Do share and let me know what is your favourite clay mask (if you have one). Thanks for reading and do come back again for another story. This is my favorite mask too! This is my favorite mask too!I'm using my 3rd tube of Clarins Pink Mask since 2009. Wanted to try Out of Trouble but heard it has the minty cooling feel, I'm not fond of that, so din't have enough guts to try it yet. I'm scared I don't like it afterwards and the whole tube will go to waste. Yes Sharon, I know u love this mask! You can ask for a sample from Origins. This is my next favourite mask after Hydraquench! But it has become more pricey especially after the increased in price. Have you tried using the Origins Out of Trouble 10 min mask? Did it work? Clarins is the best facial products I've ever used. I just want to share with you that I get my Clarins facial products from LahBeauty.com. They offer the best price in town.